New Delhi, Oct 23 (IANS) Hindustan Aeronautics Limited (HAL) Chairman T. Suvarna Raju backed the India-Russia Fifth Generation Fighter Aircraft programme on Monday, saying it will bring home niche technology, even as the programme appears to be stuck over its high price. Asked about the project, Raju said it was a “dream” for him and he expects to see it through. 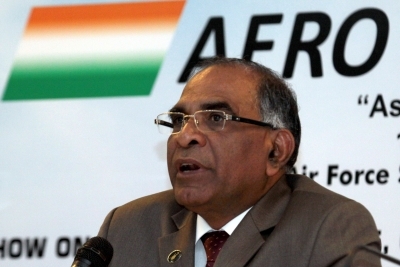 The HAL CMD said it was an opportunity for India as a country, and for the industry as well. “This is an opportunity for us to go in for this kind of technology which no one else in the world is offering us… Let’s see how it unfolds,” he said. He was speaking at the sidelines of an event to handover the 50th AL31FP engine, manufactured by HAL Koraput from raw material phase to Indian Air Force. The papers of the engine were handed over to Vice Chief of Indian Air Force Air Marshal S.B. SEO. “Fifth generation is an opportunity for India to learn the technologies and I would definitely see this will be the first project, the way the contract has been written, it has lots of benefits and it will definitely have a very positive impact,” he said. The long delayed programme for a Fifth Generation Fighter Aircraft that India and Russia were to develop together appears to be stuck, primarily over prices, as India feels it is very expensive. A committee was constituted by the Defence Ministry to look into the details of the programme between India and Russia, which has been in the pipeline since 2007. The committee recently submitted a report on the programme to the Ministry. However, as per the report, the cost of developing four prototype fighter jets would cost around $6 billion, which is very high according to officials in the Defence Ministry. India and Russia had inked an inter-governmental pact for the FGFA project in 2007. It was to be based on the Russian Sukhoi-57 or the PAK FA T-50 fighter jet. India has earlier also expressed to the Russia side that the project’s cost was too high, and had also discussed buying the Su-57 fighters. In December 2010, India had agreed to pay $295 million towards the preliminary design of the fighter, also referred to as ‘Perspective Multi-role Fighter’ (PMF). However, negotiations faced various hurdles in the subsequent years. There were several disagreements between New Delhi and Moscow, including on work and cost share, aircraft technology, as well as the number of aircraft to be ordered. After evaluating the first PAK FA T-50 prototype (the Russian prototype of the PMF), the Indian Air Force (IAF) wanted more than 40 changes – addressing, among other things, perceived weaknesses in the plane’s engine, stealth, and weapon-carrying capability.